New Normal Definition of so-called "Low Volatility" during Holiday Period. The New Normal Definition of so-called “Low Volatility” during Holiday Period: In this post, we have highlighted the New Normal Definition of so-called “Low Volatility” during Holiday Period for Sterling (GBP/USD) Dollar with the help of our Technical Analysis as shown below. The charts discussed here are daily and monthly time frame charts of the Sterling (GBP/USD) Dollar Forex currency pair. Generally speaking, they say Low Volatility time specifically coincides with the Christmas Holiday Period. This Low Volatility period can be thought of for the period from 24.12.2018 till 04.01.2019 for 2018-2019. Low Volatility happens when the big banks are on holidays. Low Volatility can mean poor price movement. Low Volatility means low price movement which can equate to minimal trading opportunities for Forex traders. 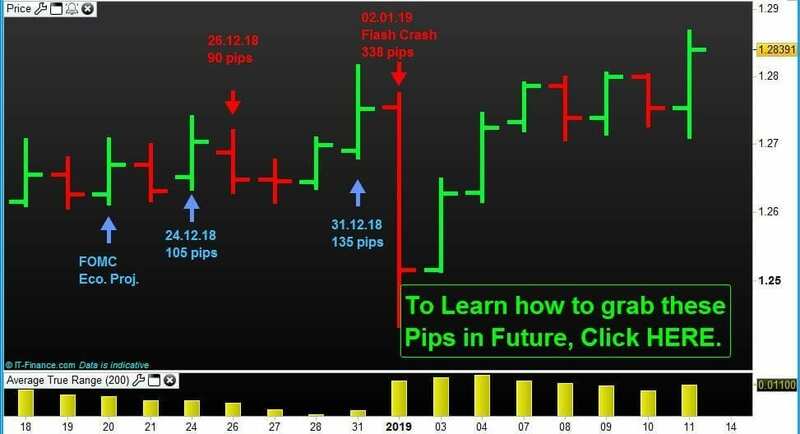 On 24.12.2018 (Christmas Eve), GBP/USD moved a big 105 pips (percentage in points). On 26.12.2018 (post-Christmas), GBP/USD moved 90 pips. On 31.12.2018 (New Year Eve), GBP/USD moved a solid 135 pips. On 02.01.2019 (post-New-Year day), GBP/USD moved a massive 338 pips. We need to remember here that the 200-day Average True Range (high price – low price) for Sterling (GBP/USD) Dollar is about 110 pips as of now. But from above we can see that during the so-called low volatility days Sterling (GBP/USD) Dollar printed higher values than the 200-day Average True Range as shown below. The New Normal Definition of so-called “Low Volatility” during the Holiday Period. How you can take advantage of Our Technical Analysis for the Sterling (GBP/USD) Dollar Market. Above chart is a monthly chart for Sterling (GBP/USD) Dollar forex currency pair. The immediate resistance line is drawn from last month’s high which price can break maybe tomorrow (14.01.2019) or in near future. This month’s (January 2019) close can be above the high of last month’s (December 2018) high which was 1.2840. Now price is trading just shy of 1 pip from that level of 1.2840 at 1.2839 at the time of writing this post. The monthly Trend line is drawn from the swing high of April 2018 to the swing high of September 2018. Last month’s price has closed above the said trend line. Now we only need to see that this month’s (January 2019) price is trading above the high of last month’s (December 2018) high which was 1.2840 for GBP/USD to possibly go up. This immediate rise in price can be up to 1.3048 as shown in the chart. Now the question is what the price of Forex Pair Sterling (GBP/USD) going to do in future. To technically identify the next possible price objective for Forex Pair Sterling (GBP/USD) in the Professional way so that it will be easier for you to Trade Forex Pair Sterling (GBP/USD) in future from the current level and to find out the answers to all your Trading related queries, please contact us at 03 9566 7275 and book your FREE discussion session for 30 minutes at Level 3, 2 Brandon Park Drive, Wheelers Hill, Victoria 3150. Now you can learn to trade Forex Pair Sterling (GBP/USD) with us to explore the possibility of earning passive income keeping your day job. 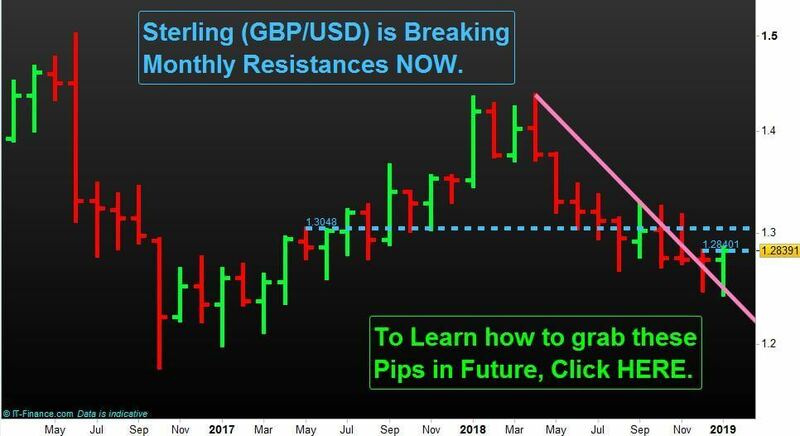 Our Proprietary Forex Trading Strategy which work will guide you through every step of your trading in Forex Pair Sterling (GBP/USD) and explore the possibility of earning extra income. Learn what all other Forex Currency Pairs we are Trading in our Forex Trading Asset Class. Develop yourself as a professional trader capable of capturing second income in the future with us.